Vegetable of the Day (Williams-Sonoma) (Hardcover) | Copperfield’s Books Inc. In this illuminating collection, you'll find a different vegetable dish for every day of the year. Rustic and elegant, simple and complex, classic and contemporary, these 365 recipes will inspire you to put seasonal vegetables on every menu. Bursting with color, texture, and flavor, vegetables reflect the changing seasons better than any other type of food. In spring, such brightly flavored dishes as new potatoes with peas or grilled artichokes with lemon aioli are welcome after the cold months of winter. Come summer, menus regularly fill with golden corn fritters or puffy corn souffl's, saut ed or grilled red and yellow sweet peppers, and tomatoes in countless guises. When the cool days of autumn set in, cooks slip winter squashes into the oven and stir mixed-vegetable braises on the stove top. With the advent of winter, dishes such as Brussels sprouts with chestnuts, creamy scalloped potatoes, and braised fennel with saffron become candidates for the season's holiday tables. 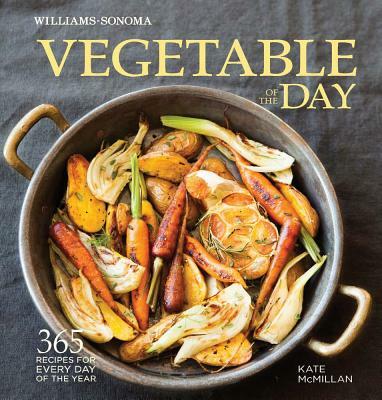 Williams-Sonoma Vegetable of the Day brings together 365 seasonal recipes, one for every day of the year, in this attractive, practical volume. Each of the 12 chapters opens with a colorful monthly calendar that provides an at-a-glance view of the dishes included. From January to December, you'll find recipes that suit every occasion, from a weekday family supper or a summer backyard barbecue to a celebratory dinner, and that fit every schedule, from quick saut's to slow braises. Each recipe is accompanied with a note that might describe seasonings or unusual ingredients or offer serving suggestions, ideas for variations and garnishes, or other helpful tips. Many of the recipes are illustrated with full-color photographs to guide you as you cook. But vegetables are more than just great seasonal markers. They are also nutrition superstars, and we all know that we should be eating more of them. This book is packed with inspired recipes that promise to help you do just that. It will encourage you to try vegetables that you have always passed up because you didn't know how to prepare them, and it will give you new ideas on how to cook old favorites. So, go ahead and open this year-long celebration of vegetables and start cooking. Kate McMillan is chef and owner of an eponymous catering company and an instructor at Tante Marie's Cooking School in San Francisco. Kate has worked as an event planner for Vogue and Glamour magazines. She lives in Northern California with her husband and three young daughters. Erin Kunkel is an award-winning food and lifestyle photographer who works around the world, and calls the foggy outerlands of San Francisco home. When she's not behind the camera, she can be found gardening, cooking, and dreaming of warm water surf spots.